Solvent based inks are the most permanent and fade resistant as the solvents become part of the vinyl unlike other inks that just sit on top of the material. Printing capabilities can go up to 16 feet wide and roll lengths can be a few hundred feet long. 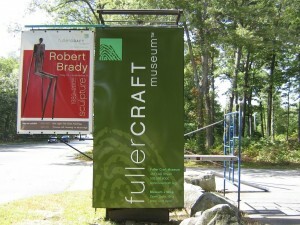 Large vinyl panels can be seamed and welded together to create even larger banners. Solid durable vinyl banners range in weight from light weight 9 oz to heavier weight 22 oz. Mesh banners can be used where a lighter material is needed and for windy areas on buildings.Banners can be printed single our double sided. Surface finish comes in matt or glossy, smooth or textured and can be either front-lit or back-lit. Vinyl used for printing is coated in order to accept the inks better. Vinyl banners can also be treated with firesafe chemicals to make them flame resistant. Vinyls we use range from a light 7.5 oz Mesh to a heavy 22 oz reinforced vinyl. For most small to medium size banners we print on 13 oz materials. This can be either smooth or reinforced giving the material a slight texture. The smooth vinyl is mostly used indoors. Small copy reads much better on it than on the reinforced vinyl. Reinforced vinyl is the better choice to use outdoors given it’s inherent strength from the reinforced material used. Vinyl also comes with a solid black back or white.The black backing will not show the front image through the back-side. We also have a 72″ wide biodegradable 15 oz BIOMAT vinyl. This is a sustainable green printing product. Pole Banner Pro 18oz, is a heavy duty block-out banner material for indoor and outdoor applications. It’s woven 1000 x 1000 scrim provides stability and strength. It can be printed double sided.